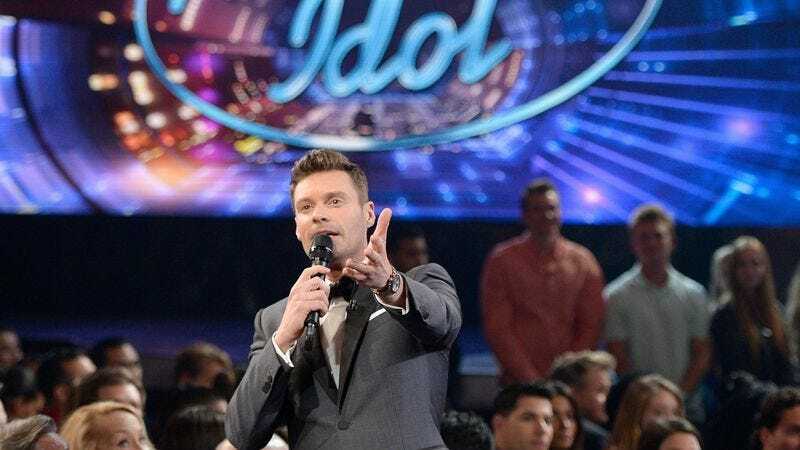 In what is, perhaps, a biological inevitability—swallows must fly to Capistrano, salmon must swim upstream, and Seacrests must go where the belted showtunes are—Variety reports that former American Idol host Ryan Seacrest is in ”advanced talks” to be current American Idol host Ryan Seacrest yet again. Although Seacrest’s camp downplayed the rumors, other sources say we may be well on our way to another installment of the host’s TV-karaoke reign. If Seacrest does get involved with the recently resurrected musical corpse, at least he’ll be keeping things in the family. Earlier this year, he signed on to be Kelly Ripa’s new co-host on Live With Kelly, which is aired on ABC, the new home for the revived Idol. The only real problem would be Seacrest’s schedule; besides his Live gig, he hosts a daily radio show on iHeartRadio. Meanwhile, Variety also confirms that ABC plans to air 40 hours of Idol during the show’s 2017 season, meaning we can expect the series to once again take up multi-night dominance on the weekly TV schedule, just like the good (?) old days.